Sire: Herding Instinct's Herra Watersedge (IMP SWD) -"Markku"
Dam: Fidelis Haltiatar (IMP FNL) -"Taru"
Kovu is another Watersedge puppy that has arrived here at Toujour Kennel. What a boy! We have big hopes and dreams for this boy and i bet he won't disappoint. From two imported lines a blend of Swedish and Finnish lines Kovu will be a boy to watch as he develops - the show ring will be where is will start his career but we are hoping he will take to agility - only time will tell. We thank Melissa Waters from Watersedge Kennel for entrusting us with this precious boy and we hope he will do his parents and breeder proud. Kovu is proving to a lively boy who has a happy dispostion to meet people and dogs. He presumes the world loves him and that the ladies find him irrestible. Kovu is smart and catches onto training fast with a food treat and a positive attitude. Kovu loves sheep, playing fetch, going to the beach and meeting people. In the show ring he is striking and sometimes a bit of a happy goof ball (tongue lolling to the side and bum wagging). Kovu has started some agility foundation training at home and the results are showing. I think the hardest challange for him will be working under heavy distractions at a real trial. I look forward to seeing what Kovu achieves in the future after he matures mentally and physically. 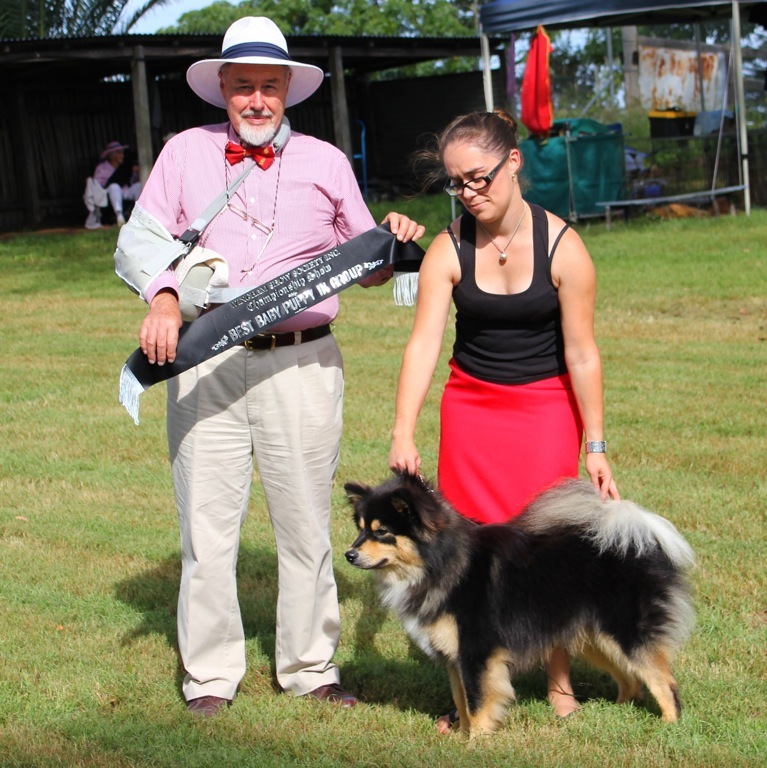 At the Stroud Show under judge Ms C Timms (NSW) Kovu gained Junior In Group. Unfortunately we missed out on having a go in General Specials and having a photo with the judge. 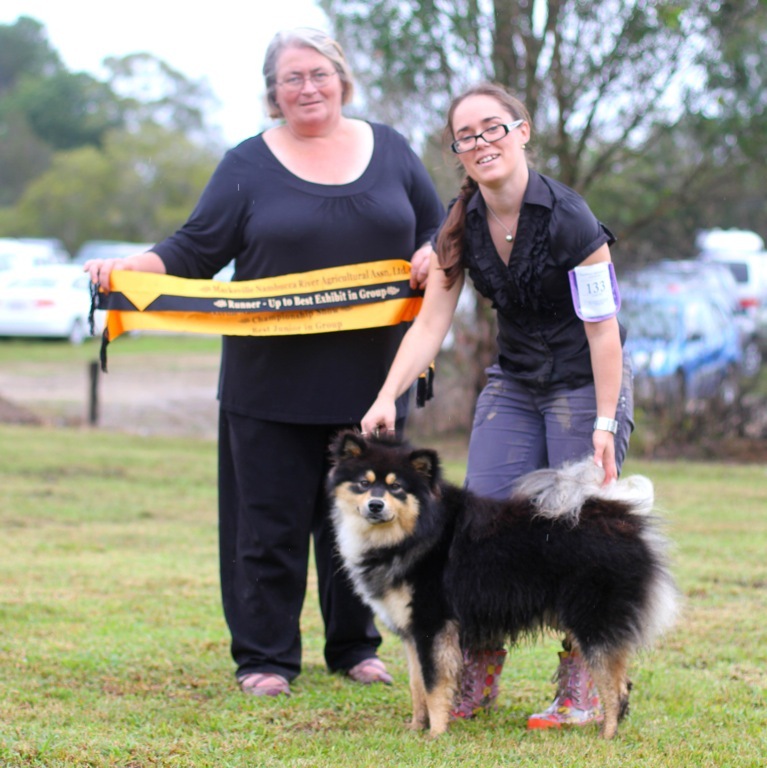 At the Camden Haven PAH&I Society show Kovu was award Best of Breed (8pts) and went on to win Puppy in Group! !